Rows of elegantly formed, bisque-fired bowls, plates, and cups line floor-to-ceiling shelves in Keith Phillips’s spacious studio in Fletcher. The clay pieces await the next steps of a journey that begins with the application of rich, warm glazes and ends with an overlay of ornate patterns and detailed, often whimsical, imagery. Closer inspection of the completed works reveals a giraffe dressed in vintage military garb adorning a coffee mug or a dog in matador’s attire depicted on a bowl. The message and humor are subtle, says the artist. Blending original and borrowed images, Phillips juxtaposes fantasy worlds astride utilitarian objects. “Borderline steampunk” is what he calls his collage style, in reference to a genre of science fiction fantasy employing elements from the age of steam-powered technology. “I’m big on pattern and embellishment,” the artist says while flipping through a heavily illustrated, Victorian-era French dictionary. It’s one of his sources for sampling engraved images, along with a favorite 1920s Montgomery Ward catalog and numerous vintage pattern books. Phillips began his artistic life as a printmaker, after earning his bachelor’s of fine arts degree from East Carolina University. He moved on to a career as a web developer, then the dot-com crash led to a position in Montana as assistant to noted ceramist Walker Davis. There, he learned every aspect of working with clay. 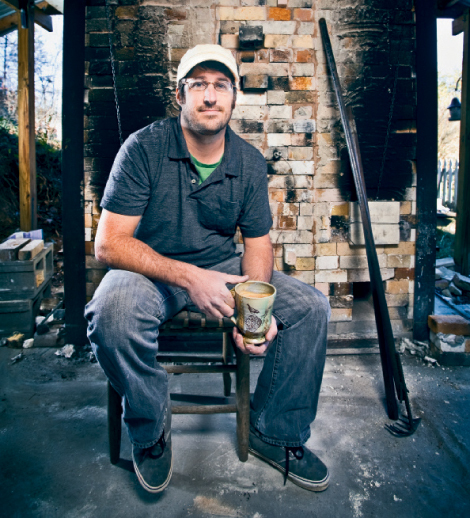 Returning to North Carolina in 2001 with his wife, Gina, and two young children, Phillips built a wood-fired brick kiln and began to perfect his process involving the use of decals. His signature style is showcased under the moniker Mudstuffing Pottery. Phillips’s method begins with glazing. “I’m a big fan of the happy accident,” he says. “In fact, I try to make as many accidents as possible early in the process.” Sometimes this means applying glazes at random, or throwing materials such as salt and soda into the kiln, which vaporize and alter the finish in surprising ways. After two firings, the decals are ready to be applied. The images are silk screened or Xeroxed onto decal paper, then affixed using a toner transfer process in which the paper is soaked and rubbed onto the pot. During a final firing, the paper and toner burn away, fusing the iron in the ink on the surface. Recently, Phillips began sculpting busts and applying this same technique. The clay figures, he says, are a change of pace from the heavy demands of his utilitarian pottery.